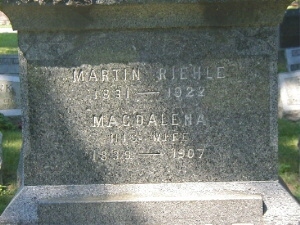 Martin Riehle was born on November 11, 1831, in Wagshurst, Baden-Württemberg, Germany, son of Johan Georg Riehle (1795-1859) and Maria Anna (Kraus) Riehle (1799-1836). 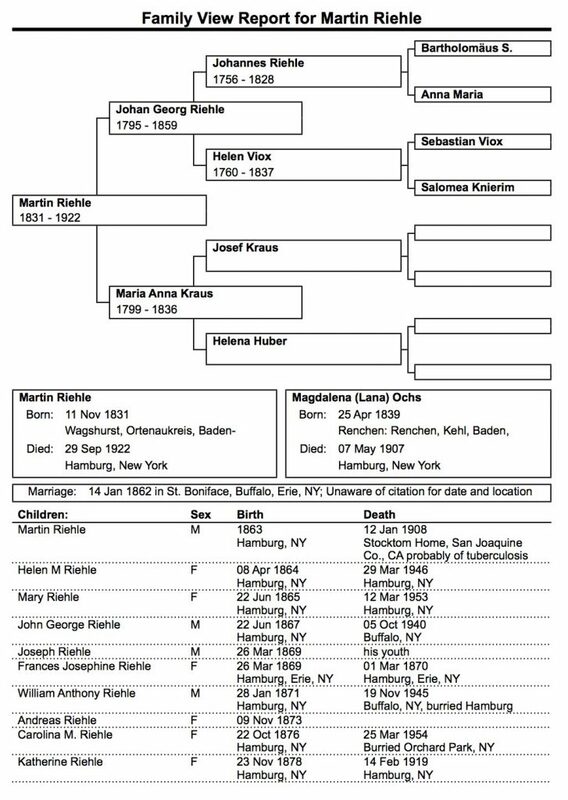 Census and other records indicate that he immigrated to the Buffalo area in 1852, became a naturalized citizen in 1860, then returned to Baden to marry, or arrange to marry Magdalena (aka Lana) Ochs with the marriage reported to be on January 14, 1862, in Buffalo, New York. They had ten children in 15 years, with seven of these surviving to adulthood. Martin died on September 29, 1922, in Hamburg, New York, at the age of 90, and was buried there. 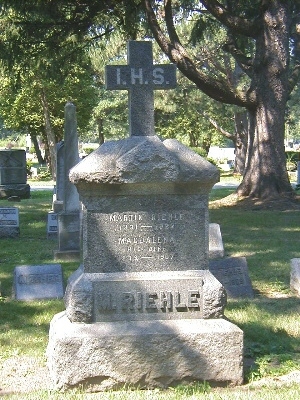 We believe that Clemens Riehle, Martin’s brother, immigrated 2 years after Martin and joined him for a time in the Buffalo area before moving on to Cincinnati, Ohio. Although their father married three times, Clemens was Martin’s full brother. Three generations of their ancestry are shown below with more detail available. While we have quite a bit of information on Clemens we have much less on Martin and his descendants so we encourage any of his family in Western New York to contact us by replying below. Above photo taken at St. Peter and Paul’s Cemetery in Hamburg, NY.